No matter what issues of religion and politics have occupied us over the past week, there has been a feeling that we ought to be following the umbrellas, black T-shirts and yellow ribbons spreading over Hong Kong. And not only following, but concerned enough to burden our souls with their symbolic meaning, think past the chop-suey, and pray. The battle is nothing new: the people want the right to elect their freely-chosen candidates to govern them; the government seeks to vet those who may stand as candidates and thereby rig the election. Whether it is China, Cuba, Vietnam or the old Soviet Union (not to mention North Korea and a host of “former” Communist countries), the coercive one-party state – which often cloaks itself beneath the façade of multi-party democracy – is antithetical to every notion of liberty. The people may have freedom of speech, freedom of assembly and freedom of worship (as they do in Hong Kong), but God help you if your speech is too condemning of the government, or your assembly too troubling for the police, or your worship so zealous that it demands manifestation in the public square. In the Communist state, disobedience can be a capital offence. The western TV cameras may catch the tear gas and broadcast anger. But we can never know what corrective punishments are being meted out in the police cells. In Hong Kong, anyone may stand for election as long as they accord with China’s socialist precepts and Marxist-Leninist dogma. Perhaps that’s too strong: anyone may stand for election as long as they are trusted by the Chinese government. Trusted, yes, that’s better. After a century of British administration, Marxism in Hong Kong may be muddled with manifestations of state capitalism and conflated with all manner of residual assertions of social liberalism, but, essentially, the governing elite forms the representative (ie Beijing-friendly) nominating committee which selects candidates and approves the Chief Executive. This is the constitution bequeathed to the people of Hong Kong by Chris Patten. Despite having the right to universal suffrage (which, it must be observed, the British never granted under colonial rule), tens (hundreds?) of thousands of student protesters feel their freedoms are being negated and their rights infringed. And so they demand the resignation of Chief Executive CY Leung for his handling of the situation. But the Chinese Communist Party is having none of it, not least because Hong Kong enjoys considerable liberties never dreamed of by the People’s Republic, including an independent judiciary and a free press. With universal suffrage, they aver, Hongkongers have never had it so good. “The crucifixion of Jesus is political in meaning,” said Protestant theologian Rose Wu. Indeed it is: to live out the Christian faith is to participate in the structures of the state while confronting economic, political and economic injustices. Without freedom, this mission is impossible. Without freedom, there are no crosses, Bibles or prayer meetings. 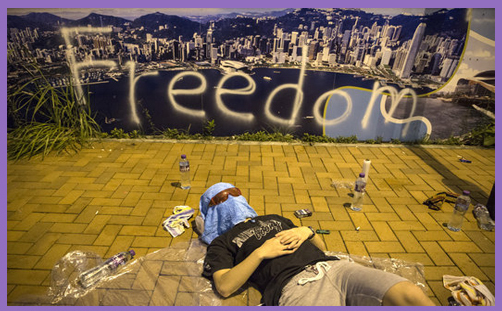 Democracy in Hong Kong is not simply a secular political pursuit: it is a manifestation of liberation theology. It is part of God’s battle for man’s freedom.